Every Friday afternoon we get a happy delivery to our email: a free weekly vegan recipe from the Humane Society of the United States as part of their effort to promote Meatless Mondays. Of course everyone knows about the Humane Society. Some of yours and our most beloved pets came from local Humane Society shelters – they are all over the country, saving dogs, cats, bunnies and other critters from homelessness and neglect every day. But the Humane Society’s mission goes far beyond finding homes for domestic animals (as if that weren’t enough!). The HSUS advocates for all kinds of animals on all levels. They are involved with animal rescue at disasters scenes; wildlife sanctuaries; legislation involving animals such as testing and cruelty; farm animal protection; and low-cost spay/neuter services for pets. And that’s just a quick overview! The Humane Society is the nation’s largest and most effective animal protection organization. Even though the HSUS does all this good work for our furry and feathered friends, they still have time to send out a vegan recipe to subscribers each week. And let me tell you, the recipes are always top notch. 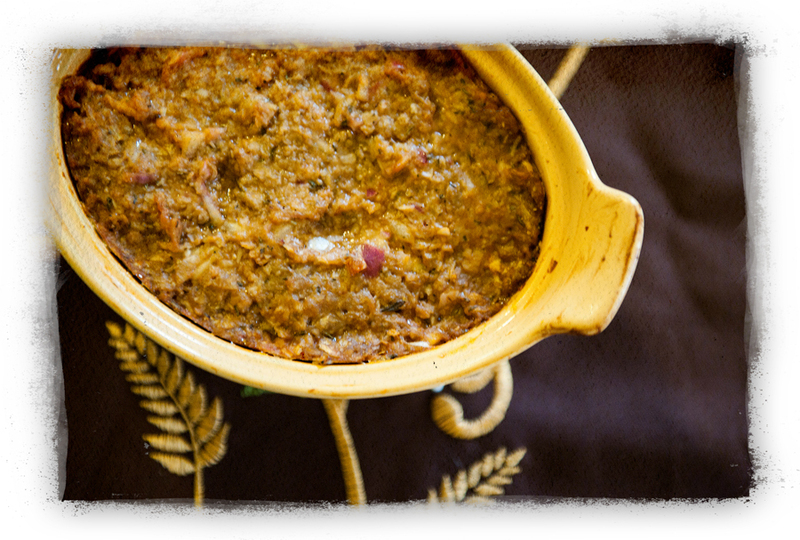 We have made several of them and the Meat-Free Meatloaf, a recipe created by Gail Berrigan, an editor at the Humane Society’s website, has become a regular favorite. We have made it for multiple family dinners – and my parents, neither of whom are veg, have both requested this dinner again and again. You know I can’t re-print the recipe here. I don’t have permission for that. Gail’s Meat -Free Meatloaf recipe is such a winner, though. You need to try it right away. The ingredients are simple – we like to use LightLife’s Gimmee Lean Ground Beef for the “meat”. Aside from crumbling the Gimmee Lean and chopping the small onion, this Meat-Free Meatloaf comes together almost effortlessly. You just mix everything together and throw it in the oven. Crazy easy. Try Gail’s Meat-Free Meatloaf. Then sign up for the Humane Society’s free weekly vegan recipe and stay – browse around their site a little. You will be inspired by all the good work they are doing for animals of all kinds. Okay, so you’re thinking, “What would a dirty hippie know about soap?” – sure, that makes sense. But really, neither one of us is truly dirty. We bathe regularly and consider handmade, natural, vegan soaps to be one of the fine luxuries in our lives. Which brings us to SoapBox Soaps. Ever think of washing your hands for a good cause? The founders of SoapBox Soaps did. These two Boy Scouts have a mission: to donate a bar of soap for each one purchased. Upon learning than many pandemic diseases could be greatly reduced with basic sanitation, friends Eric Vong and David Simnick built a business model that has joined forces with UNICEF and dozens of other national and international aid organizations. 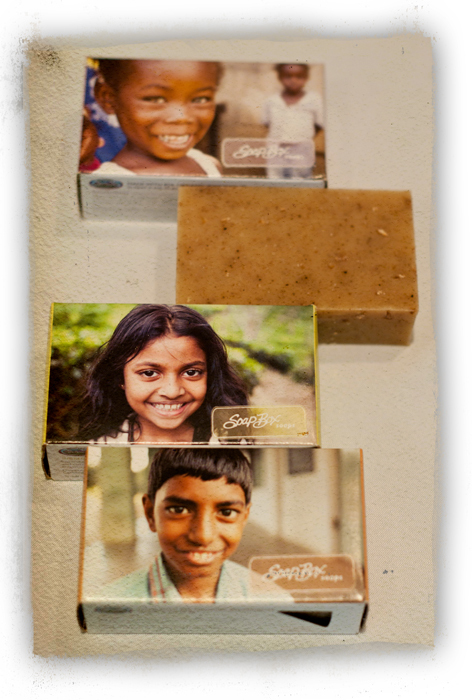 Each purchase of SoapBox soap means a bar of this natural soap will go to a person in need. And considering that over 24,000 children die every day from complications of unsanitary living conditions, it’s clear that a simple bar of soap can do more than just smell good! But these soaps do that, too. They smell great – in fact, we’ve been using one as an air freshner in our office for the past few days. Lovely! SoapBox soaps come in 3 scents: lavender, oatmeal clove and lemongrass. Each variety is created in the USA using USDA certified organic ingredients. There are no harsh chemicals used (no parabens or sulfates) and no preservatives are added, so that each bar is incredibly fresh. You can buy SoapBox Soaps from the company’s website. Or they are now available at Whole Foods as well! While you’re online, be sure to check out their mission page, too. Inspiring stuff! Now, off you go. Scrub, scrub, scrub – I mean, you wouldn’t want someone to mistake you for a dirty hippie, would you? Our garden is just brimming with peas right now. So after salads and stir fry, we got creative with this tasty veggie! This dip is better after it chills in the fridge overnight, but not much of it usually lasts a whole night in our house! Add peas to boiling water and cook for about 3 to 6 minutes, until bright green and tender. As soon as they’re done, rinse them in a colander under cold water until they are cool to the touch. 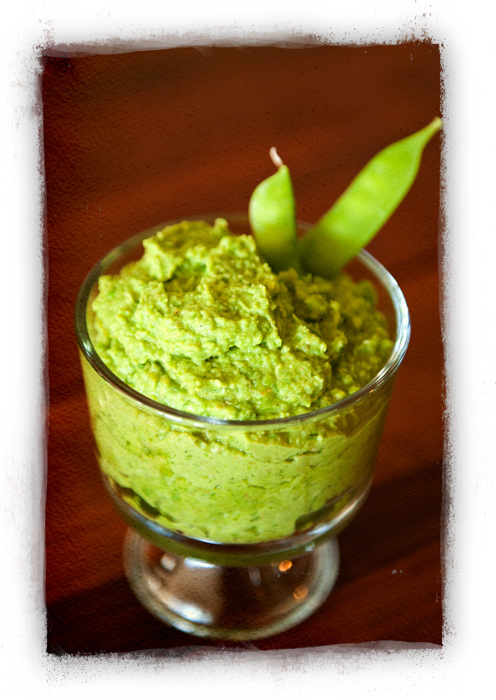 Combine peas with all other ingredients in a food processor. Whirl around until smooth and creamy! Mmmm. Serve chilled with crackers, veggies or use as a sandwich spread.